We clean out the inbox to end the month of April. We start with an interesting article from Field and Stream that my long time (I'll pass on the word old,since she is younger than me! ) 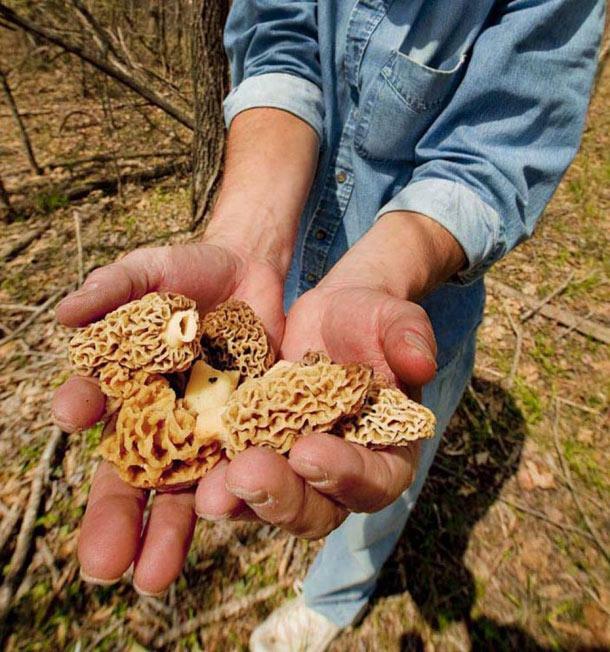 friend Drista Bowser posted on Facebook on hunting Morel Mushrooms. As you all know,I am crazy about mushrooms and you might remember from a post last year,I am attempting to grow them through a tree stump with plugs infused with spawn from various 'shrooms. As much as I would love to find and eat these and as simple as this article makes things clear,I would still wager that the lovely Cherie will still have a panic attack about my poisoning myself and not allow me to do so. I'll be careful,honey-I promise !!! Former ABC soap staples All My Children and One Live to Live return to the "air" with new online versions with some of the former stars. I thought it was a shame two years ago when I wrote about the silly cancellation by ABC and how much I always enjoyed watching OLTL with my late Aunt Edna during summers off from school. She loved her soaps so much,so I have a soft spot for the soap genre' even though I long ago quit watching. Good for them for bringing them back! I enjoyed a weekend of championship boxing and I agreed with both decisions that had champions retaining their titles. I thought Sergio Martinez won the final two rounds,which he had to have to retain his middleweight title. I had Martinez ahead of Martin Murray 114-113,while Danny Garcia kept his junior welterweight titles over Zab Judah on my card 117-111 in an exciting fight. Looks like one of our favorites here at the world headquarters has found a spot as Erik Arnesen will be the number one starter for the Somerset Patriots of the Atlantic League. The Atlantic League is the top league in Independent baseball and is noted for being a jumping point back into the affiliated world. 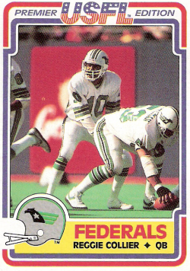 SB Nation scores with this offering based on Reggie Collier,who was a QB that I watched often in the USFL with some other mentions of quarterbacks that starred in college and in Canada. You may not agree with all the opinions that are offered,but it still is a cool look back at exciting players in their day. Finally a goodbye to former heavyweight contender Carl "the truth" Williams,who passed away at the age of 53. The talented Williams possessed a terrific jab and is best known for his losses in two title fights,a razor close loss to then undefeated Larry Holmes and a first round stoppage against Mike Tyson,that I thought was premature. The Cleveland Browns "paid it forward" on the final day of the NFL Draft as the Browns traded their first two picks for future picks down the road. Cleveland traded its 4th round pick to the Steelers for a 3rd rounder next year and then swapped their fifth rounder to the Colts for a 4th rounder next draft. Now,I would say that's pretty good value,but that does not address the teams needs for this season,especially at safety,where one was needed badly. Cleveland did take a safety in round six,but it's a player that is coming off a torn Achilles tendon in Notre Dame's Jamoris Slaughter. Slaughter says he is 90% recovered,so that's a good sign,I suppose to possibly be ready for training camp. Slaughter was injured in the Irish's third game of the season,so I would say that's likely. Cleveland took two small college players with their seventh round picks and added players on each line. Armonty Bryant is a defensive end with good size (6'4 263) and dominated at the level for East Central Oklahoma. Bryant has had off the field issues having sold marijuana to an undercover policeman,but this is the round you take chances with little risk. Garret Gilkey is a huge (6'5 300 lb+) tackle from Chadron State (home of Don Beebe) that again dominated at his level by sheer size. I don't have too much of a problem that the Browns traded picks for the future,if they truly did not like the available talent in this draft.That part I understand,but it did little to add depth this season. 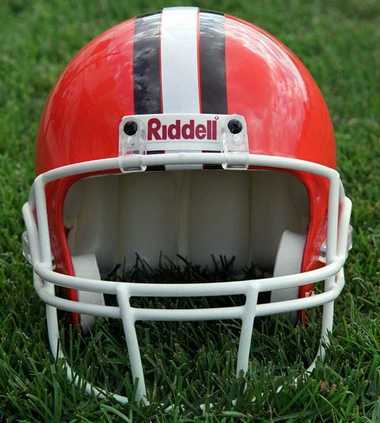 As far as the draft goes-I like Barkevious Mingo and Leon McFadden is fine in round three,so talent wise I am OK.
What I am concerned with are the reports that the Browns could have moved down to 12 with an reported offer from the Rams that would have landed Cleveland a second round pick. Assuming this is true and it is similar to the trade the Rams made to move to 8 with Buffalo,the Browns could have landed Jarvis Jones there as a pass rusher,a corner or safety in round two and the other in round three,making the Browns a better team. I like Barkevious Mingo and think he will be fine for Cleveland,but considering the whole picture,I might have preferred the trade with the Rams. Before a few thoughts on tonight's title fights on HBO and Showtime,I want to let everyone know why I have not been posting as many MLB posts as I would like. I just haven't been seeing as many games as I would like and I don't feel comfortable writing about games that I have not seen. I simply can feel the blog changing a bit and I'm not saying it is better or worse,just can feel a transition. I think Devils game to game coverage will stay mainly because in the winter,I have more time on my minds and the same for Browns and Ohio State coverage as well. However,as sad as it is- with the minor league season,I just don't see as many Pirates/Indians games. I'll still have plenty of stuff on trades and the draft and I'm going to work on our Pirates and Indians top prospect series (better late than never) soon. That's not to say that that game coverage is gone,just that it might not be as often. HBO has a three fight card tonight that headlines WBC (and generally recognized as the world) Middleweight champion Sergio Martinez returning to his home country of Argentina to defend that title against England's Martin Murray. 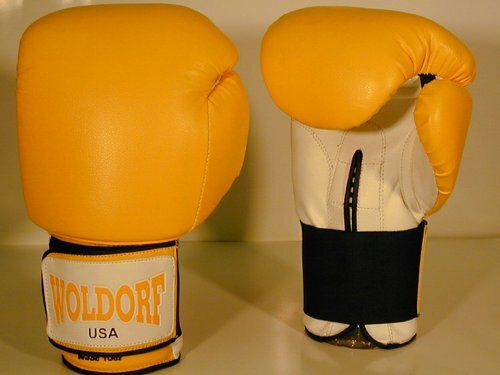 Murray is not a soft touch,being one of many to be robbed in Germany against Felix Sturm when Sturm owned the WBA belt and has a real chance against Martinez,mainly because Martinez is coming off a knee injury suffered in his bout against Julio Cesar Chavez Jr and for a fighter that thrives on movement,that brings questions to mind. HBO also features heavyweights Chris Arreola against Bermane Stiverne in a bout to decide a mandatory contender for a Klitschko brother. Showtime features WBA and WBC Jr Welterweight champ Danny Garcia defending against Zab Judah in a bout with so much heat between the two that they cannot even sit together for the same press conference. However,as I have stated in the past,no one has gotten more shots for less results than Zab Judah and I would be amazed to see Judah come up big in this one. Garcia easily,but it could be entertaining. Flashy Amir Khan returns from England for a bout against faded former champ Julio Diaz. Peter Quillin defends his minor middleweight belt against prospect Fernando Guerrero,who was once very highly thought of before losing in his only real test. Guerrero has won a few bouts since then,but against no solid opposition. The Cleveland Browns were unable to land a second round pick on day one of the NFL draft,but they still managed to be busy as they added veteran receiver Davone Bess in a deal with the Miami Dolphins. Bess was obtained as a slot receiver to push David Nelson,who is coming off a knee injury and gives Cleveland two veteran slot pass catchers for Brandon Weeden to throw to. The Browns traded their fourth and fifth round picks to the Dolphins and in return Cleveland added the Miami fourth and seventh rounders along with Bess. Bess caught 66 passes last season,but Miami invested heavily in the wide receiver position in free agency and was looking to move the veteran after five years. Cleveland has been reported to have agreed to a contract extension with Bess,provided that Bess passes his physical. Between this move and the signing of David Nelson,the Browns appear determined to finally get production out of the slot that has struggled to occur since the days of Joe Jurevcious. Meanwhile,back by the lake,the Browns still needed to execute their third round pick and were expected to address their more glaring need,one which was more glaring after passing on Alabama's Dee Milliner at cornerback. The Browns did just that with corner Leon McFadden of San Diego State being the selection. McFadden isn't the biggest guy (5'9),but is reported to be strong in one on one coverage and an excellent tackler despite his size. This sounds basic,but often times the best cover corners struggle in fundamental tackling,so this is a plus. This is one that the Browns have to have gotten right because when you look at the depth chart,McFadden should be expected to start. I wonder if McFadden is related to the man that was part of that famous blurry fast relay back in 1969? And Mingo was his name O! The Cleveland Browns needed a cornerback badly as Dee Milliner was waiting to be selected when the sixth pick rolled around. Milliner would have made a nice corner tandem with Joe Haden,but the Browns instead decided to go with LSU's Barkevious Mingo. Mingo was a college defensive end that figures to easily make the transition to standup 3-4 outside linebacker opposite Paul Kruger in the Browns defensive set. Mingo has all the physical tools,but only had 4.5 sacks last season. One thing to keep in mind though,as much as college production means to me,there can be one exception. Sometimes,teams that are loaded with talent spread the stats around a bit and Mingo's LSU team was one of those types of teams. Mingo is 6'4 and a half and a lean 240 pounder that could be a special player. I did give a small edge to Jarvis Jones (Steelers) pre-draft for his production in college,but the physical tool advantage easily goes to Mingo. I like the pick,although there were others that I would have been fine with. As I sat on the couch with the Browns on the clock,the lovely Cherie asked me who I wanted. I said "any of these 4 and I am fine-Milliner,Mingo,Jones and Kenny Vaccaro". Barkevious Mingo to the Browns! And hey,it was not Geno Smith,so that's something! The Cleveland Browns have the sixth pick in the first round and then do not pick again until the third round. Many have written that the Browns are missing their second rounder like they lost it in a bad deal. I would take Josh Gordon over any wide receiver in this draft,so I look at the selection of Gordon as great value and not as a wasted choice. I would not be against moving down a bit from six,if they could add a second rounder,but I would not want to down past 12 ideally and no further than 14 or 15 at all. As we wrote earlier today,the position of need above all is cornerback. The top corner is Alabama's Dee Milliner,but the bigger question is this-Is Dee Milliner at six so much better than Florida State's Xavier Rhodes,Houston's D.J. Hayden or Washington's Desmond Trufant a few picks down? That is the big question and one only the Browns can answer-Is Dee Milliner better than any of those three corners and a second round pick? I tend to say no,but if the Browns stay at 6 and select Dee Milliner,don't expect a ton of criticism from this scribe. Safety is also a need and if the Browns decide to go early,Kenny Vaccaro of Texas is the class of the bunch. Vaccaro is the best safety prospect that I have seen in a while and is from a program that has sent several safeties to the league. If the Browns wanted a pass rusher early,there are plenty available and a tradedown would still land a similar player as they would pick at six. I like Georgia's Jarvis Jones,who did not workout as well at the combine or any of that stuff,but his play in the SEC was above the others in my opinion. Most like Oregon's Dion Jordan more than I,looking at the tools and numbers. I prefer production from players at the major college level and I cannot place my finger on why,but I have a gut feeling about Jordan being a disappointment after being picked high. LSU's Barkevious Mingo might be a nice choice as well and I like him better than Jordan in many ways,but his college production was not what I would have liked it to be either. Nabbing Mingo at 12 would be a bargain,at 6,mildly concerned. Texas A&M's Damontre Moore has slid down the boards of late,but can play DE or LB and I think Moore would be terrific in round two,if a tradedown occurs. Inside linebacker also needs an addition and to me the standout is not Notre Dame's Manti T'eo,it is Georgia's Alec Ogletree. 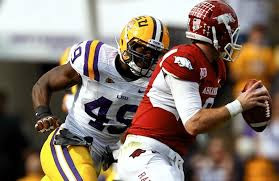 Ogletree is my top player at the position and if the Browns decide not to go there,round three might be time for LSU's Kevin Minter. I don't think the D-line is a huge concern,but BYU's Ziggy Ansah has been a Browns rumor. Ansah brings stud tools,but is raw and makes me think workout warrior. I would have problems with that selection. I would not be against Ohio State's John Simon and his high motor as a day three pick. Offensively,I am not in favor of another quarterback,at least early. This is a less than great crop and I am more inclined to allow the Browns to give Brandon Weeden/Jason Campbell the year to see what happens. I'm hoping these Geno Smith rumors are smokescreens to hope someone trades up. I'm going to be very disappointed if that is the pick. If the Browns take a day three flier,there are a few of interest. Florida State's E.J. Manuel is interesting,but I bet he goes before I'd consider him and the same goes for Oklahoma's Landry Jones. If the Browns could add an extra third through trades,I'd be interested in either. Tennessee's Tyler Bray has size and the best arm in the draft and that might appeal to Mike Lombardi. 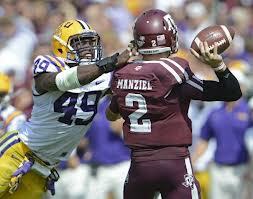 I doubt the Browns pick a running back at all,but if so Texas A&M's Christine Michael has appeal as a later pick. Cleveland's wide receivers have improved,but I wouldn't be against any of these either. 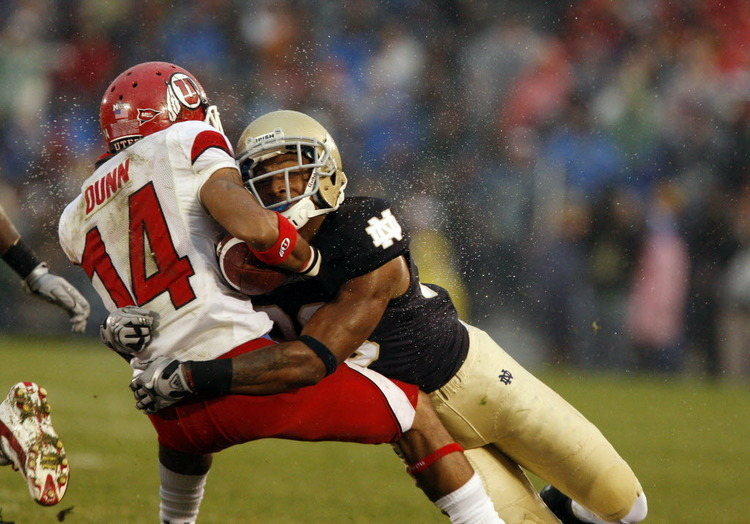 West Virginia's Tavon Austin reminds me of Percy Harvin and USC's Robert Woods is going to be a standout for someone. I also like Cal's Keenan Allen as well as two sleepers for day three. Baylor's Lanear Sampson was overshadowed by Josh Gordon and Kendall Wright and will surprise some people and I love South Carolina's Ace Sanders as a third down speedster and value as a kick and punt returner. Jordan Cameron deserves a full chance to use his tools at tight end,but there are two terrific ones in this class as Notre Dame's Tyler Eifert and Stanford's Zach Ertz could go in round one. I wouldn't be thrilled at six,but later in the round-both would offer excellent value. I cannot see the Browns taking a tackle or center,but the guard spot could be addressed. Of course the standout is Alabama's Chance Warmack,who has been compared to Hall of Famer Will Shields,but guards rarely go in the upper half of the first round. Jonathan Cooper of North Carolina could go in the first round,but two intrigue me for the Browns in the second and third days of the draft. I have concerns,no matter the player at six,so for once I am advocating a tradedown,but if I have to stay at six,here are my top five,if I were doing the drafting and considering who has a chance to be available. 1) Dee Milliner CB Alabama-Breath held here. The Cleveland Browns have several needs and perhaps too many to be addressed in one draft. I think that the most glaring need is in the secondary as two new starters would be excellent additions. Joe Haden is near Pro Bowl level at one corner,but there are major issues at the other as undersized Buster Skrine would be the starter,if the season started today. I think that corner is the top need. Safety could use a new teammate for T.J. Ward as Usama Young was released and Eric Hagg was disappointing in his time as a starter. The Browns also could use another pass rusher at linebacker,despite the signing of Paul Kruger from Baltimore. The move to a 3-4 defense turns Jabaal Sheard from a proven 4-3 end to a gamble on Sheard being able to stand up as an outside linebacker. Considering that,the Browns will still need a rusher to cover their rear and fortunately that is the position of strength in this draft. An inside backer would not be a bad idea either as only D'Qwell Jackson is a proven player for now. The defensive line was solid before and looks to be the strength of the defense now,so anything but a late round best player on the board pick would be a surprise. On the offensive side of the ball,there is no glaring need,but all can be upgraded with further talent. Branden Weeden does not seem to be the flavor of the month for the Banner/Lombardi gang,but the Browns have no other younger alternative,so a pick might make sense on day three. 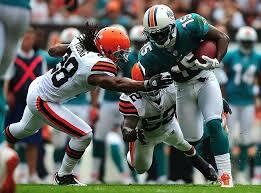 Trent Richardson is solid at running back,but fullback is a major need after the disappointment of Owen Marecic. Wide receiver is not the wasteland that it was last season with the emergence of Josh Gordon and Greg Little and the signing of David Nelson,but it still could use improvement,especially with a catch and go receiver from the slot..
Jordan Cameron still has much to prove at tight end and Ben Watson is now elsewhere,but a high pick would make more sense if Cameron cannot break through this season. The offensive line is strong at the tackles with Joe Thomas and Mitchell Schwartz and at center with Alex Mack,but the guards could use help with Shaun Lauvao being a mild disappointment and Jason Pinkston coming off blood clots that ended his season early. If there is a way to land a second rounder,the Browns could take a guard on day two. A seventh rounder might be spent on a kicker to replace Phil Dawson and a punter might also be a seventh round possibility. Looking at this team,they could go in many directions as needs are all over,but a corner is of highest need after the Browns puzzling lack of addressing this in free agency. We start our look back at the early stops on the signing front with the signing from the first few weeks of April. I always try to start fast so cards do not accumulate on the pile,but somehow it always manages to gather into bunches anyway,but here goes. Thanks to Derreck and Tyler Chupak,who went to the Harrisburg opener (while I was moping at the road office) and knocked a handful of cards from the Senators for me. Most of these were from the off season Topps Minor Heritage set,but an exception was Ian Krol,who was obtained in the winter three way trade that saw Mike Morse head to Seattle. The main Heritage pickups were Brian Goodwin and Matt Skole. I then went to Woodbridge Va for the first time to catch a few innings of the Potomac Nationals home opener against the Lynchburg Hillcats. I didn't have a ton for the P-Nats,but I had some for Lynchburg. The Hillcats of note were William Beckwith (really nice),Matt Lipka and Kyle Kubitza. I was able to see the Salem Red Sox twice in their visit to Frederick,after the Potomac game and the next day for "NHL Day" where I was able to get former Washington Capital Peter Bondra. The Red Sox were a pretty good signing team for a Boston team. Notable pickups were Noe Ramirez (very nice and ribbed me for wearing a Giants hat! ),Henry Owens (signed all you had post game,but did not want to sign before the game),Blake Swihart,Devin Marrero (So nice that I've become a fan) and Gavin Cecchini. Cecchini will sign what you have,but no duplicates,is very accommodating before the game (although he was frustrated with a fan that asked "Garvin" to sign a card and responded with "Man,you want me to sign a card and you don't even know my name" and didn't want to sign after the game. Thanks to Bill Cover for getting a Theo Bowe Heritage signed for me over the winter. Bill always thinks of me and it is appreciated. Thanks to "Hank" Jamison for knocking out my Frederick Keys stuff on Meet the Keys day while I finished Salem up. The help went a long way and thanks Hank! Next into Frederick were the Winston-Salem Dash (what a dumb name). I didn't have much for them either,but the teams first two picks in the 2012 draft were there and both were terrific with Courtney Hawkins and Chris Beck signing and chatting. The bigger story was Buddy Bell back in town. I was steaming mad because I had even set aside some Bell cards for the briefcase for just this situation after Buddy's visit last season and I had forgotten to put them there. As I sat frustrated,two people helped me out and allowed this big baby to relax. Brad Adams gave me a 1979 Topps of Bell as an Indian (the card sitting in front of the PC) and Tyler Chupak gave me a ball that he had found that I was able to get signed for my favorite aunt Becky,who lists Bell as her favorite player ever. Tyler helped me get the ball signed to Becky and Brad's help allowed me to get an Indians card for the collection. The mailbox then returned former Mariner first baseman Ricky Nelson. The Delmarva Shorebirds hit town with Frederick native Branden Kline,who signed everything with a smile and I got a Bowman Silver Ice (I really like those) among others signed. Shortstop Adrian Marin signed his USA and Bowman and was very nice as he signed. Other Shorebirds of note were Roderick Bernadina,Christian Walker and Torsten Boss. Former Astros catcher and Delmarva manager Luis Pujols signed two cards,but was not happy about it and was reported from two excellent sources to have blown up the following day about signing. Thanks to Brandon Diehl for adding a few missed Salem Red Sox for me,most notably Felix Sanchez. The Lakewood Blue Claws hit town and for the first two games,Derreck Chupak and I were the autograph corps for the games. Notable Blue Claws were first rounder Shane Watson,Roman Quinn,Art Charles (very nice) and Mitch Walding. I also added the two newest Hagerstown Suns in Shawn Pleffner and Hunter Bailey and former Royals outfielder and Washington outfield instructor Gary Thurman. Thanks as always for the Indians,Giants and Pirates from Mike Oravec-Most notable for me was a really cool 1984 Fleer of Lary Sorensen of the Tribe. Finally,I have time to talk about my trip to Altoona for the Curve's exhibition game against the Pittsburgh Pirates. Game is probably putting it lightly as I would call it a mixed scrimmage as each team had players on both sides and it was played in a similar fashion as such,although Andrew Lambo did make a nice diving catch. I went with my good friends Mike and John Oravec,who were nice enough to order tickets and then drive,lord knows that I was not able to do so. We drove the longer but less traveled road to Altoona in which the scenery is nice and the traffic is less before eating at a John Oravec favorite Eat N Park. I often stop at an Eat N Park on the way to Ohio and I always enjoy their food. The home of the "Smiley Cookie" (which Cherie and Rachel were rewarded with a dozen) serves a pretty good burger as well. 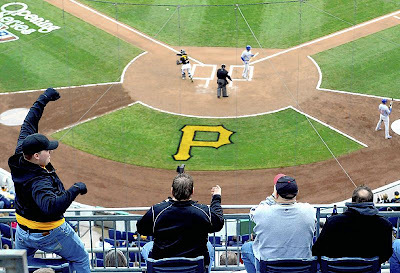 I always enjoy Blair County Ballpark (There is now a corporate name too) and on this day,it was packed! As in over 10,000 with the team selling standing room tickets for a record attendance. Mike and John had never been there so we took several tours around the park to see everything that there was to see,which is plenty. The Curve did very well in letting the gates open so the fans could see the Pirates take batting practice and the obligatory pre-game festivities. I didn't see a ton of players signing,but time was short with everything going on and I completely understand that the time was short. The only two that I remember seeing sign was Chris Leroux and A.J. Burnett,but again time was short. I also don't remember a ton about the game,scoring it would have been a nightmare and other than Lambo's catch and a grand slam homer by Starling Marte,I don't seem to remember much at all with the constant changes from both teams. Thanks again to Mike and John for a great day and allowing me to share John's birthday present with him! The Cleveland Cavaliers finished off a season that saw them show flickers of improvement with plenty of bad basketball with the firing of head coach Byron Scott with one year remaining on his contract. Scott had been with the team for the three years that LeBron James had been on South Beach and with the team having two picks in the top 18 (one of them being no worse than sixth) and plenty of cap space,Scott figured to be in the position of being the beneficiary of the teams expected off season improvements. Scott won just 64 games in three seasons,but was handicapped by the loss of James,lack of talent and constant injuries to his top two players in Kyrie Irving and Anderson Varejao. 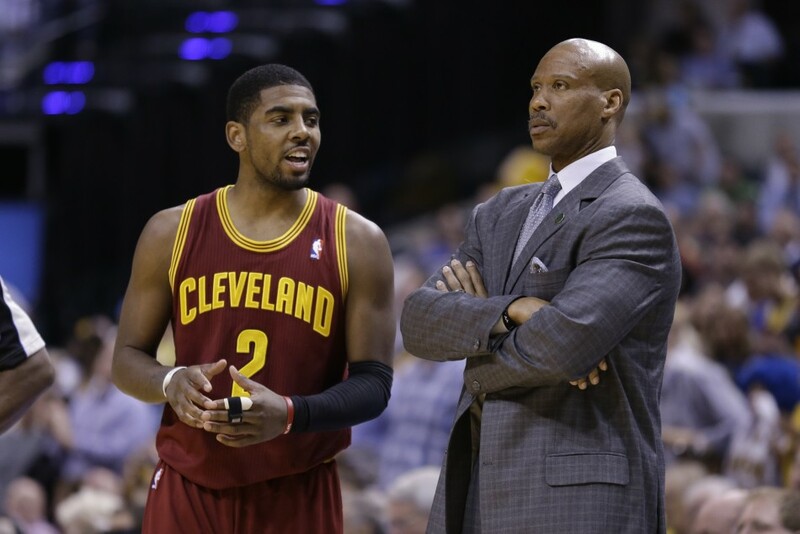 The hot rumor is former coach Mike Brown,who Scott replaced,returning to resume the role of head coach for the Cavaliers. I must admit that this prospect thrills me very little. Brown's team had the best player in the game,but seemed consistently out of joint offensively and lacked any type of offense other than clear the floor for LeBron. Brown's teams were very solid on the defensive end,but I would prefer someone else. I liked Byron Scott and thought he was a good coach that deserved to stay for the good times after tolerating the bad. However,considering the importance of this off season with two more first rounders and a veteran free agent or two coming in,if there was uneasiness with Byron Scott's system then I can see why the Cavaliers thought that now was the time to part ways. Since that commitment is now made,Cleveland needs to make a strong hire as the next two seasons will determine where the franchise is headed. The New Jersey Devils finally snapped their long losing streak by beating the one team that I hate more than any other-the Philadelphia Flyers 3-0 in Philly. The Devils had not won a game in their previous ten tries and needed a win to keep their barely flickering playoff hopes alive,so the win accomplished two things on the evening. Martin Brodeur stopped 23 shots in earning the shutout victory. New Jersey received goals from Adam Henrique (11 Empty Net),Ryan Carter (5) and Matt D'Agostini (3). The Devils have two weekend afternoon games coming up against Florida and then the Rangers in a desperate attempt to pull out a playoff spot. 1) Before we get too excited about playoff hopes,here is the situation-six points out and five games to play. I think they need a minimum of four wins and a lot of help. However,the Devils do have two games against the Rangers (8th playoff team),so some of this is in their own hands,but the Rangers games are must wins AND they must do so in regulation. I just think it is too much to overcome,but it is always nice to beat the Flyers! 2) The best line on the ice was the fourth line of Stephen Gionta,Ryan Carter and Steve Bernier. Carter scored the game winning goal,Bernier just missed on another and Gionta almost missed on a shorthanded chance at short rang after a nice defensive steal of the puck. 3) Martin Brodeur was solid in goal,but what I was more impressed with was the defensive corps. The Devils did not allow the Flyers more than an a handful of really good opportunities. 4) One of the few good things that I have seen over the losing streak has been the maturation of Adam Larsson,who had played very well during the streak and continues to play well. 5) Now I know that the playoffs are nice and I never turn down losses over the Flyers and Rangers,but if the Devils cannot win both games this weekend,I'll consider the playoffs dead and then hope for a top ten draft pick. I am not as knowledgeable on the hockey draft as I am the other three league drafts,but this is touted as a very deep draft,a top ten pick could go a long way in the Devils future. Still a little rundown,so I haven't been posting much. I have not been able to watch Pirate games and since the Devils playoff hopes have faded,I haven't been as vigilant on my writing,although I have seen them. I have made a decision on my current overtime (rather a special someone has "helped" me make it :) )and I hope to be a little more normal in a week or two. We start with quite a few goodbyes. Goodbye to Annette Funicello at the age of 70. Funicello was best known as the female teen idol of the 50's from her days on the Mickey Mouse Club and for her 60's beach movies with Frankie Avalon,but to my generation,she was better known as "America's Mom" for her commercials for Skippy Peanut Butter. Funicello had battled Multiple Sclerosis for the past twenty years that left her largely out of the public eye. My most memorable memory of her was her parody of her own films in the 80's with Avalon in "Back to the Beach. Ryan loved the film when he was younger and I bet I've seen it a hundred times from back in the VCR age. Goodbye to the NFL play by play voice of my generation as Pat Summerall passed away at the age of 82. Summerall was best known for his teams with first Tom Brookshire and then John Madden on NFL broadcasts,but was first a player with the Giants and Cardinals. Summerall is the rarest of all announcers-the former player that became a play by play man,not a color analyst. Summerall was also an excellent announcer on CBS golf telecasts and was well suited for golf with his quiet and low toned voice. Pat Summerall also will be remembered as someone that admitted a problem with alcohol and for his eventual liver transplant that he spent much of his time after the transplant as a crusader against the hard living of his earlier years. Roger Ebert,film critic for the Chicago Sun-Times and co-host of "At the Movies" with several hosts,most notably the late Gene Siskel died at the age of 70. Ebert had battled cancer that cost him a jaw and the ability to eat,drink and speak in recent years,but had still continued his work with rating films. Jonathan Winters passed at the age of 87. Winters was a comedian and occasional TV guest star from the early stages of television and was held in high regard by comedians of his time,but never seemed to hit mainstream stardom. 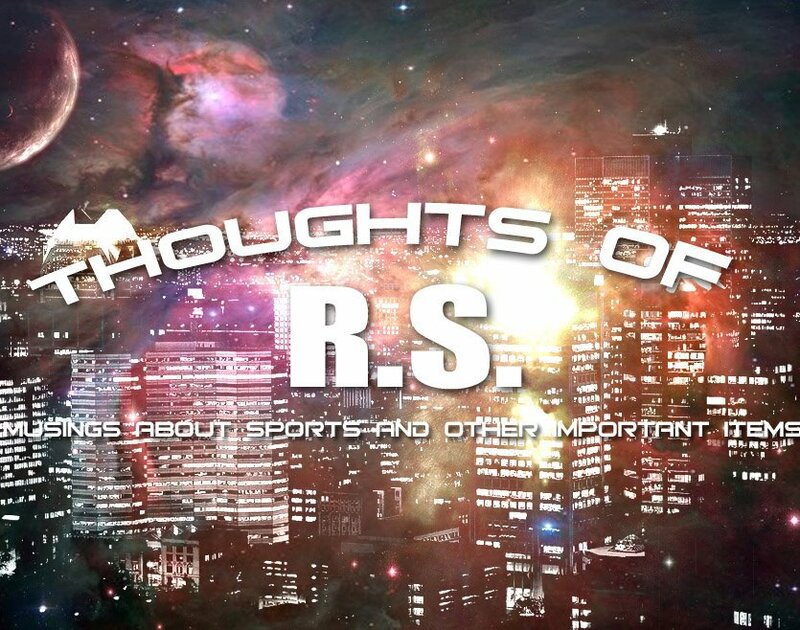 I have always been a Bob Costas fan and Grantland takes a look at his recent work in advocating positions beyond sports. 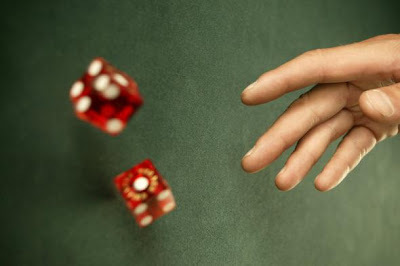 I have an issue doing that during games as a play by play or color man,but in a hosting role,my issues are not as large..
Ryan sends me this blog from former soft rock star Richard Marx's apparent crackup in his dealings with another blogger. Why Marx cares about various opinions is beyond me,but I give him credit for at least being honest instead of the PR softsell. Apparently,a meteorite from Mercury has been found that may be the first ever from the planet. It appears to be either from Mercury or a similar planet and is thought to be well over four billion years old. More from Florida,which is being terrorized by the Giant African Land Snail. The snail can eat its way through plastic and stucco and its shells are sharp enough to puncture tires when vehicles run over them. For now,it has been isolated to the Miami area,but the snails breed and multiply rapidly-as in 1.200 eggs per year and it gets better as they carry a parasite that can develop Meningitis. That is a pretty ecologically and biologically dangerous animal. Sorry,this will be a hair shorter as it took my efforts almost all evening to gain access from the road office. 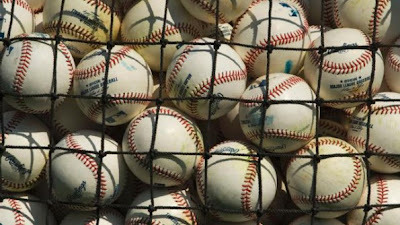 Yes,it's true,after an interesting encounter with the Hagerstown Suns,things were resolved,so I have canned the prepared post and decided to eliminate possible additions in good faith. Suffice it to say,things were interesting at the Muni and if you were there,you know what happened. I had mentioned in a previous edition of the Overhand Right that Jr.Featherweight champ Nonito Donaire was making a serious mistake in not making the bout most wanted to see against Abner Mares. Instead due to the Golden Boy/Top Rank embargo,Donaire was fighting the third rated fighter in the division in WBA champ Guillermo Rigondeaux and dropped a unanimous decision to the two time Olympic gold medalist in NYC. For all the power of the rock fisted Donaire,he is a counterpuncher and is going to look less than exciting when matched against fighters that refuse to engage. Rigondeaux certainly was not going to do that and the resulting close win for the Cuban defector was one that was less than pleasing to the fight fan. Other than an entertaining exchange in the fourth round,the fight featured much of Rigondeaux moving away and an uncomfortable Donaire forced to plod and chase,not his optimum use of his skills. 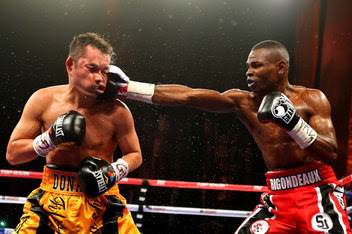 Donaire did drop Rigondeaux in the tenth round,but Rigondeaux was not seriously hurt. The irony is that Abner Mares would have marched forward,made a great fight,helped Donaire shine and likely a Donaire win as well. Donaire will likely move to 126,while Rigondeaux got the win,but I see little future for him as far as marketability. Few are going to want to fight him and not very many are going to want to televise his defenses either..
Hopefully,back later with a little Masters talk and maybe (Net permitting) a look from the signing front. I had a discussion with two members of the Hagerstown Suns management tonight and I did have a few issues that came up that frankly made me think of these days. I had prepared to write about this issue tonight,discuss what and why and talk about who screwed up. However,after talking to a particular person in the Suns front office,I decided to hold off on things for a day and see what the response is. I know that sounds like a cop out,but what I didn't want to do is blast everyone involved and either make a situation worse or hammer someone when they were working to resolve the problem. The offensive woes of the New Jersey Devils continued as the Devils lost yet another game-this time to the Ottawa Senators 2-0. The loss is the Devils 9th in a row and continued their slide from playoff contention. The Devils will travel to Toronto in their next attempt to stop the losing streak. 1) The losing streak is the second longest in Devils history. 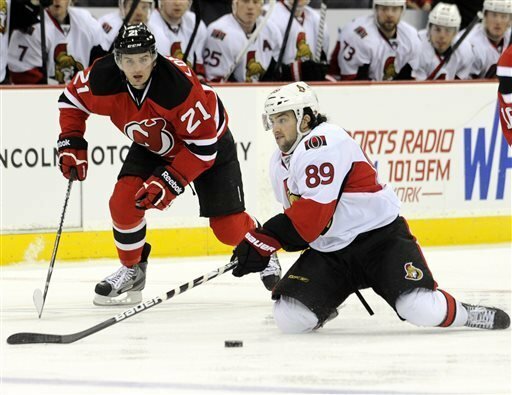 2) The Devils have not won one game since the shoulder injury to Ilya Kovalchuk. Not that I am blaming all of these losses on not having Kovalchuk,but there is little doubt that the Devils offense flows through Kovalchuk,whether he is scoring or not. 3) The Devils continue to win the battle of shots on the net,but cannot win the one of goals into the net. Some of this is bad luck,but still as I have written-much of this is simply a matter of quantity of shots and not always quality scoring chances. 4) Adam Larsson played a very strong game and I loved the more physical brand of hockey that the Swede has begun to play. Larsson has been compared to the Bruins Dougie Hamilton as they were both top ten picks in the same draft and Hamilton has been the more precocious of the two starting their careers. 5) Awful job by the referees in this one,missed penalty after missed penalty,most notably a deliberate cheap shot by Ottawa goalie Craig Anderson with the knob of his stick to the face of Adam Henrique. They weren't the difference in the loss,but they did not help and cost the Devils several opportunities to get back into the contest. 6) The Devils look to be out of the playoff hunt and the chances of a better pick in the draft loom. The Cleveland Browns made a trade yesterday with (Gasp) the Philadelphia Eagles a few days after signing a veteran wide receiver that could prove to be a helpful signing..
David Nelson ( No,not son of Ozzie or brother of Ricky) was signed to a one year contract to be the veteran pass catcher that the team has missed for years. Nelson is the big (6'5) and physical receiver to play in the slot that the Browns have not had since the days of Joe Jurecvious and has the hands to be the check down pass catcher that Brandon Weeden did not have last season from the position. The former Florida Gator was a starter for most of two seasons before suffering an knee injury in the season opener for Buffalo last year. Nelson caught 61 passes and five TD's just two years ago and was a key factor in why Ryan Fitzpatrick was signed to a contract extension one season and released the next. Nelson's size and strength should be a nice red zone threat and had he not been injured,I would wager that Nelson would not have been available to sign. Yesterday,the Browns made a trade with the Eagles that obtained the likely replacement for Josh Cribbs in the Cleveland return game. As surprising as it is to acquire another Eagle (sarcasm),the Browns did need to add someone before the season for kicks,punts or both and Dion Lewis should be able to do that as well as some third down duty out of the backfield. The former Pittsburgh Panther usually returned kickoffs for Philadelphia and occasionally made a cameo as a running back and will fill a similar role in Cleveland. The cost for Lewis was not prohibitive as the Browns sent linebacker Emmanuel Acho in return for Lewis. You may remember that I thought Acho might be a steal for the Browns in round six last year,but injured a knee in training camp and spent the season on injured reserve. Still have more to catch up on,so look to be back tonight from the road office with Devils-Senators and another catchup post perhaps. I spent the Hagerstown Suns opener with Rachel and have a few things to say,but first I want to comment on the sudden rumor of the team being "willing to listen" to Fredericksburg VA in their considering building a new stadium and attracting a team to play in it. No,I am very concerned about the team leaving town as I have been for quite a while,but not to Fredericksburg. Fredericksburg is 33 miles from Woodbridge Va,which is the home of the Potomac Nationals and their notoriously tight-fisted owner Art Silber. That distance allows Potomac to block any team in their radius,so I would wager Fredericksburg would be building a park for independent baseball and not as a home for the Suns. I understand Bruce Quinn floating that idea to attempt to break the logjam in negotiations,but just as the threat of the Frederick Keys allowing no future team to enter Hagerstown if the Suns leave town,the same would be applied to the Potomac Nationals,who don't exactly set the world on fire in attendance. The Suns home opener was fun with Rachel,but once again featured a few eye rollers. First,the good news,the team now has an area for kids to romp around in and occupy the uninterested children,so that's a good touch. Well,the in game "entertainment" featured a "Jimmy John's" make a sub contest that will be tough to top as the wind tossed the various parts of the "sub" around the field and the PA system still works too well in some areas and hardly at all in others. I am not aware of Jimmy John's being in the area,although I may have just not heard of a new store,so I wonder why a franchise that does not have a store in the area is advertising with the Hagerstown Suns,although you take money wherever you can get it in business. Editor's Note;There IS a Jimmy John's here in Hagerstown,It is in a part of town that I rarely go to,but this makes more sense to me now than it did when I wrote this. Thanks to Corey Cunningham for letting me know! But the worst was reserved for "Midwest Dueling Pianos" which featured music (and I am generous in using the term) pre-game at the typically obnoxious Muni decibel levels. A rhetorical question,Why do I always find myself under the speaker that screams everything when I want to avoid the noise,but cannot hear when I need to,like a pitching change? In any case,the piano playing was fine,but the singing made me think of my bad lounge singer act around the house. I asked Rachel which she preferred and she said "You are,but that doesn't mean I want to hear you sing". When these guys broke into "Sweet Caroline" by Neil Diamond,who I cannot stand,I was tempted to revoke my check to prevent deafness. In any event,whoever in the front office that decided to book these guys certainly did not get their moneys worth and I'd be surprised if they returned in the future. Editor's Note II;Dueling Pianos returns twice later this season. They must have either A) been cheap or B) have a fan or family member involved in booking them. The field clearly had some damage in both left and right fields (especially left) and it did not look pretty. The groundskeepers have my sympathies when you consider what they have to work with in the Muni,but truth is truth and it didn't look good. I hesitate to blame anyone for that as it is early and might be beyond anyone's control,but facts are that left field was filled with blemishes and it was clearly visible. The graphing was good as the Suns knocked out whatever they were asked for and Delmarva was strong as well. Local prospect (Frederick) Branden Kline was especially accommodating as was Adrian Marin from the Shorebirds and there were no problems at all. Thanks to the team,who allowed us free reign of the area for signing since there was no one in the "suite area".which has not always been the case. I never have a problem not being there when the seats are sold,as long as we can be there when they are not. Good work there and thanks for the help! It's always nice to spend time with Rachel and try to teach her more about the game,so that was an added bonus from the evening. Municipal Stadium has its flaws and something needs to be done,but there is something to be said for the old park,especially on opening nights,catching up with my friends from the winter and seeing what we had waited for all winter..
A quick cleanup as I wanted to get something up. I've been a bit tired and haven't had time to watch many games. The Pirates have been on the West Coast and I haven't seen any of those games. The Devils played Boston last night and lost,but I missed the beginning due to job one and the final period due to job two,so I see little sense in a recap. I still have plenty to write about though,when I am motivated (maybe tonight) as I still have to write about the Browns newest addition,my Altoona trip,some graphing news from the first few days of the graphing season and tonight's Hagerstown Suns home opener with some more news on the Suns status in Hagerstown with thoughts on the supposed new player for the team and why I don't believe a word of it. 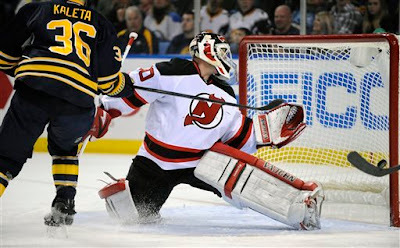 The New Jersey Devils needed a win against the Buffalo Sabres badly to aid their flagging playoff hopes. What they gained instead was one point after a 3-2 shootout loss to the Buffalo Sabres. Once again,the shootout corps could not score and forced Martin Brodeur to be perfect,which he was not in allowing one goal. Devils goals to Steve Sullivan (6 power play) and Mark Fayne (1 shorthanded). The Devils are off until Wednesday when they face Boston at the Rock. 1) Spent the game as the guest moderator at Rachel's Facebook page "Devils fans outside of New Jersey." Met some great Devils fans and had a blast talking to them during the game. Of course,we added a few plugs for here as well!! 2) Mark Fayne's shorthanded blast that allowed the Devils to add one point was terrific,but the play was all due to the hard work and puckhandling of Dainius Zubrus. Zubrus moved the puck from end to end,kept control around the net and only then did he put a sharp pass to the wide open Fayne. 3) The Devils shootout woes continue,but Patrik Elias was tripped when Ryan Miller came out of the net. That should have been a "re-do" and the referee simply refused to make the call. 4) In any case,the Devils will have to address this shootout issue in the off season. 5) Steve Sullivan did add a little jump to the team. 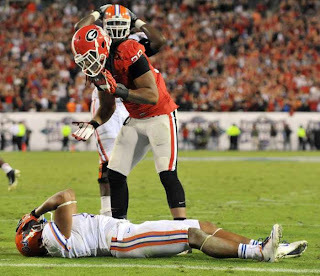 6) Quiet part of the loss? On the Buffalo second goal,the Devils could have forced an icing call,but instead loafed up the ice. The Sabres managed to touch up,keep possession and then score. 7) Travis Zajac-dumb penalty after dumb penalty. 8) Sorry that I missed the Toronto post,all day on the road took it out of me. I did watch the game,but no energy to post. Sometimes great is not good enough. Martin Brodeur was great and the New Jersey Devils put over forty shots on net,but it was not enough to overcome one fluky bounce of a skate and the Boston Bruins continued the Devils losing streak with a 1-0 win in Boston. Jaromir Jagr didn't kick the puck past Marty Brodeur,but his skate caused an erratic bounce for a fluky goal and the only one of the game. New Jersey now has a weekend series against Toronto and Buffalo. 1) Look,there is not much that I can say. Martin Brodeur played great and was victimized by a bad bounce of the puck. The team worked hard,put the puck on net (although they could have done a little more closer in),played with an high effort and played well defensively. What else can I add other than the puck just didn't go in? Well,I disagree with some of the scratches and I'm not sure that I'm thrilled with Pete DeBoer on some of those decisions,but otherwise I couldn't ask for more from an offensively challenged team missing its top scoring threat. 2) Just a quick note on the Devils one deadline move as they added Steve Sullivan from Phoenix for a 2014 seventh rounder. This is so typical of Lou Lamiorello to bring back a former Devil late in his career for a low rental cost. Sullivan scored five goals with seven assists in the desert,but the biggest note is that Sullivan left New Jersey 16 years ago in Feb. 1997! Sullivan was part of the trade that brought Doug Gilmour (an all time favorite) to the Devils. The Pittsburgh Pirates had been inept all afternoon against the Chicago Cubs,but a ninth inning uprising had trimmed a three run deficit to just one,the tying run on third and the winning run of first with no one out. Things looked good for Pittsburgh,but quickly went awry as Pedro Alvarez whiffed and Neil Walker grounded into a game ending twin killing that allowed the Cubs to leave town with a 3-2 win and Chicago taking two of the three games in the series. James McDonald was the losing pitcher,but pitched well over seven innings as he allowed just one run. The Pirates now travel west with stops in Los Angeles and Arizona. 1) I was very pleased with James McDonald's start despite the loss,especially after he looked so bad in spring outings and was ripped in his few innings in Altoona against the Curve. McDonald looked in good form as he allowed just four baserunners (2 hits,2 walks). 2) The Cubs only held a one run lead entering the ninth,but Jared Hughes allowed a two run homer to former Hagerstown Sun Nate Schierholz. 3) I know Pedro Alvarez swings from the heels and strikeouts are part of the territory with big bombers,but you just have to get the bat on the ball someway,somehow. 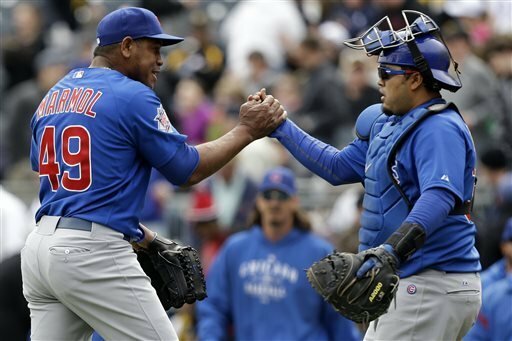 4) The Pirates have always struggled with Carlos Marmol,Marmol has struggled with himself in this series. Lacking control and a flat fastball,Marmol might be an uneasy watch for Cubs fans for a while. 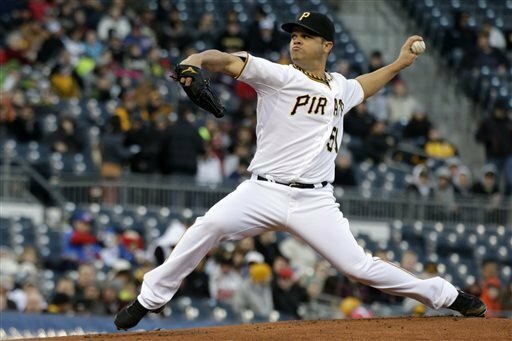 Wandy Rodriguez was fabulous for six innings and rode the waves through a rocky seventh to earn his first win of the season and the same for the Pittsburgh Pirates in a 3-0 win over the Chicago Cubs. Rodriguez (1-0) allowed just two hits,but had to survive loading the bases in the seventh before escaping in his final inning of work. Tony Watson finished the seventh and eighth as the setup man. Jason Grilli pitched the ninth for his first save of the season. Pittsburgh scored two runs in the fourth on an Andrew McCutchen double before a Starlin Castro error scored McCutchen and would score an insurance run in the seventh. The series concludes today at 12:35 before the Pirates trip to Los Angeles. James McDonald starts for the Pirates with Travis Wood taking the ball for the Cubs. 1) Wandy Rodriguez allowed only two to the Cubs over six and two thirds and was generally brilliant,but one rap on Rodriguez in Houston was that he was truly a six inning pitcher. From what I've seen that's justified,but if I can have six like last night,I can live with it. 2) Big play for Rodriguez-fighting off Brent Lillibridge in a long at bat and then freezing him with a curveball for strike three on a full count. A veteran pitch thrown with confidence. 3) Scary moment came when it appeared that Rodriguez had drilled Anthony Rizzo in the head. 4) Most of you know that I am more traditional in handling pitchers than the current fad of pitch counts,but even I wondered why Clint Hurdle kept a clearly tiring Rodriguez in with the bases loaded and just one out. Lillibridge just missed a homer when it hooked foul and missed a shot down the line by about a foot. 5) Finally,a small note-the Pirates tried to slide minor league pitcher Hunter Strickland through waivers. Strickland was claimed by the Giants,so look for a post on our sister site on Strickland. The controversial career of Colt McCoy in Cleveland ended Monday as the Browns traded the popular backup to the San Francisco 49ers. The Browns traded McCoy and a sixth round pick in the upcoming draft and received a fifth and seventh round pick for McCoy. McCoy was taken in the third round of the 2010 draft out of Texas and quickly became a popular figure with the fans in Cleveland,although he did not seem to be as popular with the two coaching staffs that he played for in his three years as as Brown. Eric Mangini's staff did not want to play him at all,preferring the near-finished Jake Delhomme and Mike Holmgren favorite Seneca Wallace,while Pat Shurmur played him,he never seemed to truly have confidence in McCoy as he often threatened to use Wallace,despite the problems that move would bring. 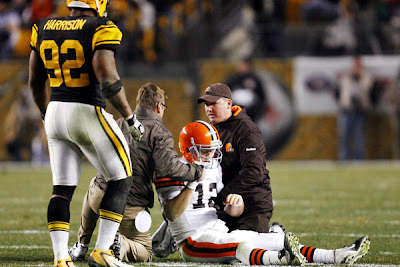 McCoy's tenure truly ended on that night in Pittsburgh,with the Browns threatening to pull a huge upset when James Harrison slammed home a huge cheap shot that concussed McCoy and would end his season,despite Shurmur returning him to the lineup. NFL Network closeups showed a clearly dazed McCoy being returned to the game and then throwing an interception that allowed Pittsburgh to hold on for the victory. McCoy would miss the remainder of the season and would then never be given a chance to regain the job as Cleveland took Brandon Weeden in the first round during the following off-season. I don't have an issue with the Browns moving McCoy at this time. The offense that is being installed does not play to the strengths of McCoy,who does not have a huge arm to throw downfield,which is a huge part of the new offense. However,I do think his skills fit much better in the Pat Shurmur offense,much better,in fact,of those of Brandon Weeden and McCoy was never given a chance to compete with Weeden. Good for McCoy,who will be a clear backup for the 49ers and good for the Browns too as they managed to get something,albeit late round picks, for someone that they likely would have released before the training camps began. Colt McCoy was a good man that never was given the chance to see if he was a good quarterback. The Browns also released two of the previous regimes free agent signees as linebacker Chris Gogong and safety Usama Young were cut and therefore saved the Browns cap space. Gogong had been a productive player in 2011,but a training camp Achilles injury forced him to the sidelines for 2012 and considering the Eagles had traded Gogong when Joe Banner was there and the hefty contract that Gogong had been signed to after 2011,this appeared to be a foregone conclusion to me. Young was signed to start from the Saints in 2011,but quickly proved to be a less than adequate solution at safety,which shows in the Browns need to add someone at the position for this season. 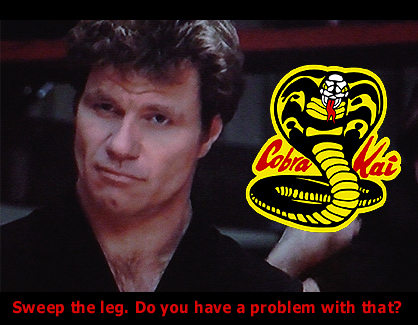 I would not have minded giving Gogong a chance in camp,but understand the cap hit that would allow a player to do so,especially if a player is coming off an injury like an Achilles that hampers mobility. Before the season starts,I wanted to clean up the backlog for the signing front before the Sharpies start rolling again! Former White Sox and Oriole outfielder Don Buford,who signed his 1967 "SOX SOCKERS" with the already autographed Pete Ward. An all time favorite card of mine! Mike Oravec,who keeps me in his loop for Pirates,Indians and Giants cards. Too many cool things to count,but standouts were Gene Freese (1959!) Andre Thornton,Charlie Spikes,Rick Manning and Dave Dravecky along with a 1969 Braves rookies card signed by both Gil Garrido and Tom House! Thanks for the help and friendship,Mike! The Superfan helped with a trade,but more importantly he did most of my sets for Aberdeen,Lowell and Tri-City. I also added a few football players including former Saints running back Wayne Wilson.Seattle wideout Doug Baldwin,49ers pass catcher Anquan Boldin (Cardinals uni) and Lee Evans in the neat Buffalo throwbacks! Adding tonight's work at meet the Suns,where I was able to get every card signed of players there in the Auburn team set and a few others and that straightens up things here until this week when things kick off. Thanks to all my helpers and looking forward to getting things started! A day late,but a freebie short as the Pittsburgh Pirates fell behind in the first and were never able to get into the game as Anthony Rizzo's first inning homer gave the Chicago Cubs all the runs that they needed in a 3-1 Cubs win at PNC Park. The Pirates would score their only run in the ninth as Andrew McCutchen was hit by a pitch,stole second and then would score as Pedro Alvarez had the teams only RBI when his single brought McCutchen home. The Cubs will be in town for the next two days,when the Pirates then travel to Los Angeles..
1) Is it possible to fan ten,allow just six hits,walk one and still not impress? I felt that way about A.J. Burnett's start. 2) Anthony Rizzo's first inning shot to right center was crushed. Considering the cold made the hammer blow even more impressive and I bet warmer weather might have sent the ball another ten -twenty feet with ease..
3) I was surprised at the number of empty seats. 4) Pedro Alvarez batted cleanup and that decision,assuming that it stays that way for a period of time,could go a long way in the lineup getting to be a reasonably good one. 5) Rachel: Dad,why do you watch the Pirates? Me; They've been my team for a long time. Rachel: What about the Indians? Me: I love them too,but I like National League baseball better. Rachel:Ok,what league do the Giants play in? Rachel: Let's watch them then,the Pirates stink. Just a quickie as I'll be on later this evening from the road office with a look back at the Pirates opening day defeat against the Cubs. I took my one day off in stride as I had plenty of things to get finished and watching both the Pirates and Giants games without going to bed,took its toll. That is why I have this admission-I slept through most of the Devils 3-1 loss to the Islanders. From what Rachel tells me,I missed little as I did see the two first period Islander goals. Alexei Ponikarovsky scored the New Jersey goal (4). The Devils are in Boston Thursday. 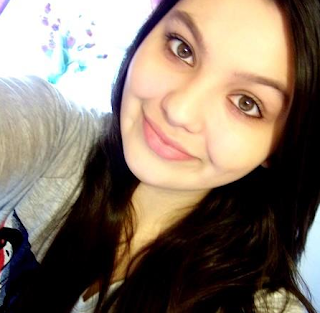 Still was a great day as I continue to teach Rachel about baseball as we watched the Giants-Dodgers game together. She's learning,as she said as she sat in her Tim Lincecum t-shirt "It's not hockey,but it's not bad". 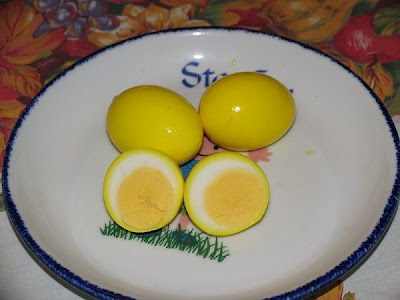 Thanks to my dad for trying to make me Mustard Eggs and dropping them off for me. I found a recipe Friday night for them and posted on Facebook about them. Sure enough,my dad and the lovely Cherie made them for me! Dad's were very good and I'll trying Cherie's soon! The Cleveland Indians were a dull,bland team that lacked in personality and showing little hope for an imminent arrival from the farm system to change anything soon. The Tribe front office attempted to change that with a few splashy free agent signings and holding onto shortstop Asdrubal Cabrera when it was thought that the team would trade him elsewhere and as a result,Indians fans have a season to look forward to that may be unexpectedly exciting. Rising star Carlos Santana continues his development behind the plate. Santana's bat will carry him,although I have reason to believe improvement defensively is more than possible. Santana will see the occasional start at first base to keep his bat in the lineup without the demands of catching.Defensive specialist Lou Marson backs Santana up as the reserve. Nick Swisher signed as a free agent when other teams backed off for either financial reasons or an unwillingness to sacrifice a first round draft pick under the new draft system. In any case,Swisher brings a switch hitting power bat to a team in desperate need of power. Swisher was signed to play right field,but a later signing moved Swisher to first base by a decision that I have some questions on. Swisher's bat would be well above average for a corner outfielder,but ranks in mid pack among first basemen.I would have rather kept him in right field. Mark Reynolds will be the regular DH and backup Swisher at first. Jason Kipnis returns at second after a up and down rookie season. Kipnis is expected to improve off the campaign,the Indians hope,but just in case ,Terry Francona favorite Mike Aviles is available if needed. Aviles will also backup Asdrubal Cabrera at short,who it was thought had played his final game in Cleveland. Cabrera's numbers dipped from his breakthrough 2011 year as expected,but still finished with 16 homers. Lonnie Chisenhall won the third base job in Tucson after a injury riddled rookie season. If Chisenhall can offer an average bat at third,the Indians would have to be thrilled. Aviles,Ryan Rayburn and Mark Reynolds all could see the occasional start at third. The Indians outfield should be a tremendous defensive group,but the bats all have questions. Michael Brantley will start in left. The Indians have always thought more of Brantley than I have and he always strikes me as a player that looks to have more ability than he shows in game play. Michael Bourn was signed as a free agent when the same procedure that hampered Nick Swisher limited the marker for Bourn. Because the Indians first round pick was inside the top ten,only the Indians of suitors for Bourn did not have to give up a first rounder,therefore giving them the inside track in signing him. Bourn will leadoff and add excitement to the lineup,but strikes out more than I would like from a leadoff hitter. Drew Stubbs was part of the three team trade over the winter that saw Shin Shoo Choo sent to the Reds. Stubbs strikes out a ton,but does have power. Considering the strikeouts and low average,Stubbs has to hit twenty or more homers to be of value in the lineup. I see him as more of a fourth outfielder. For now the Indians are not carrying a true fourth outfielder as Nick Swisher and the backup infielders can all play the outfield. Major problems with the rotation. Justin Masterson reverted to previous form after an excellent 2011. Masterson is very erratic and had a increase in walks last season. If Masterson is the same pitcher as last season,Cleveland has problems. Ubaldo Jimenez has never been the pitcher in Cleveland that he was in Colorado as his velocity has decreased and his command has never been a strength. The issues do not get better as the rotation follows. Brett Myers was signed to give stability at the three spot,but concerns over a awful spring after a year spent relieving are troubling. Zach McAllister showed flashes last season in his starts,but still has plenty to prove. Former All-Star Scott Kazmir was solid in Arizona after being signed from independent baseball,but I'll still believe an Atlantic League with a five plus ERA can be successful when I see it. I feel better about the bullpen. Chris Perez is solid as the closer and I like Vinny Pestano as the setup man. Sidearmer Joe Smith fills his role well and Cody Allen was effective last season in his opportunities. Power armed Brian Shaw and journeyman Matt Albers were added from Arizona in the Choo trade,with Francona favorite Rich Hill and the returning from injury Nick Hagadone finishing the corps. The bullpen should be a strength all things considered. If the rotation holds up,the Indians could be a real contender. I don't know think that they are to the level of the Tigers,but could be a solid second and a wild card contender. I can also see major issues with the rotation and tons of strikeouts from the lineup occurring. I'll be back later in the week with a look at my day in Altoona for the Pirates exhibition game and I hope to post an Indians preview as well as the week goes on. 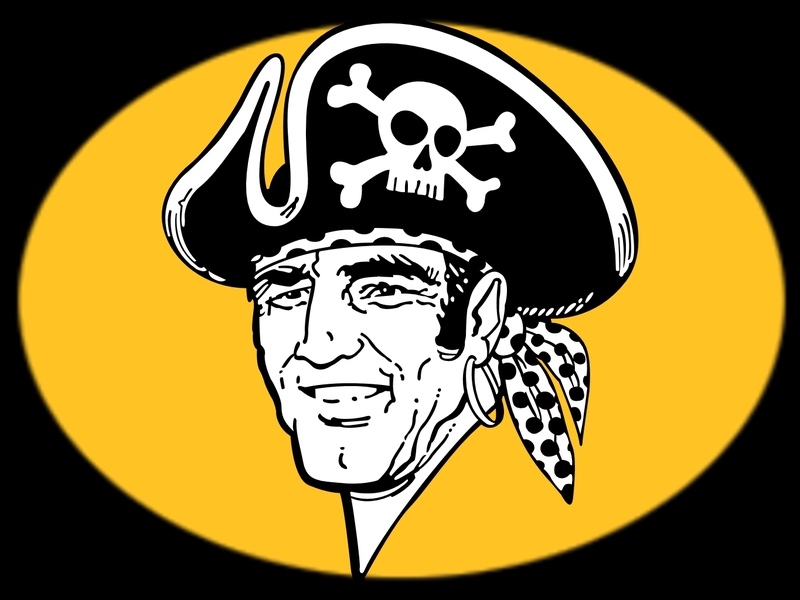 The Pittsburgh Pirates still are looking for that elusive winning season after a historic late season fade turned an almost certain snapping of the streak into another extension of losing. The Pirates and Neal Huntington made a few moves to improve the team. The biggest was the signing of free agent Russell Martin from the Yankees to bolster the catching position. This was supposed to be addressed with last off seasons signing of Rod Barajas,but Barajas was simply terrible and was allowed to leave after the season. Martin's power picked up in his two years in New York,if he can post similar numbers along with his defensive prowess,the signing will prove to be a good one. Michael McKenry returns as the backup. The infield is filled with returning starters. Garrett Jones will start at first base against righthanded pitching with Gaby Sanchez platooning against lefty hurlers.This could prove to be a productive platoon as Sanchez hit well after being acquired from Miami at the trade deadline. Neil Walker and Clint Barmes return in the middle of the diamond. Walker offers a solid bat at second and is good for 15 homers a year. 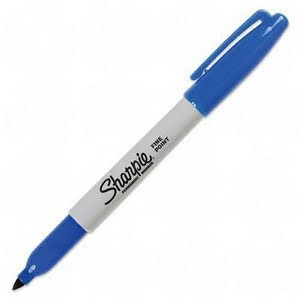 Barmes brings a tremendous glove and a weak bat to the lineup. Barmes is such a liability at the plate at this stage of his career that his .229 might be the highwater mark of his Pirates time. Pedro Alvarez brings the opposite as he brings a power bat and a less than average glove. Alvarez smacked thirty homers,but hit just.244 on the season and looks to be an all or nothing hitter,which on the Pirates is at least something. Josh Harrison can fill in at three positions and John McDonald was added from the Diamondbacks late in the spring to offer the same. Why the team needs two light hitting infielders to backup is more than I can figure out,but I fail to see why both of these two are needed. Gaby Sanchez could occasionally see some spot action at third as well. Brandon Inge will see time after he recovers from an injury that placed him on the DL. The outfield features the budding star that is Andrew McCutchen. The centerfielder put up MVP like numbers before a mild slippage late in the season. McCutchen will have to have a similar season in order for the Pirates to have a chance of contention. Starling Marte will start his first full season in left. Marte could be McCutchen light in a year or two,which would give the Pirates quite an outfield combo with the bat and glove. Travis Snider will be given the rightfield job,although Jose Tabata will see lots of at bats against lefties. Both have been somewhat disappointing since being one time hot prospects,so both have plenty to prove.. The rotation has questions to be nice and gaping holes if you prefer honesty. A.J.Burnett had his best season in years with 16 wins,but he has always been erratic and there has to be questions if he can put together a similar season for a second season in a row. Wandy Rodriguez slots in well as the number two starter as he adds a lefty presence to the top of the rotation. Rodriguez put his typical numbers up after being traded for from the Astros and seems a safe bet to win 10-15 games. James McDonald was the breakout pitcher of the first half and was terrible in the second,so one must wonder about which pitcher can be counted on in the third slot. Former Giant Jonathan Sanchez made the team as a non-roster free agent after an awful 2012 that Sanchez spent with the Royals and Rockies. Sanchez has always had good stuff,so putting it all together would not be shocking,but it would be surprising considering his control issues. and free agent signee Francisco Liriano both start the season on the disabled list,so Locke and/or Sanchez could have a short stint in the rotation. Jason Grilli will be the closer after Joel Hanrahan was traded to Boston. Grilli had an excellent 2012,but is untested as a closer. Mark Melancon was part of the Hanrahan trade and will share the setup role with Jared Hughes. Tony Watson returns as the top lefty in the pen,but strong armed rookie Justin Wilson could take that role from him. This team looks better in spots. Russell Martin is a major upgrade at catcher,but other than Martin,the lineup is pretty much the same. Travis Snider or Jose Tabata could be a huge factor if either can breakthrough. The rotation has only Wandy Rodriguez and (maybe) A.J. Burnett can be counted on. The bullpen will need Jason Grilli to be a strong closer in his first attempt in that role. I'm just not sure this is a team to break the string. It's very possible and it would not surprise me to see it happen,but my best guess tells me they are just a player or two short.